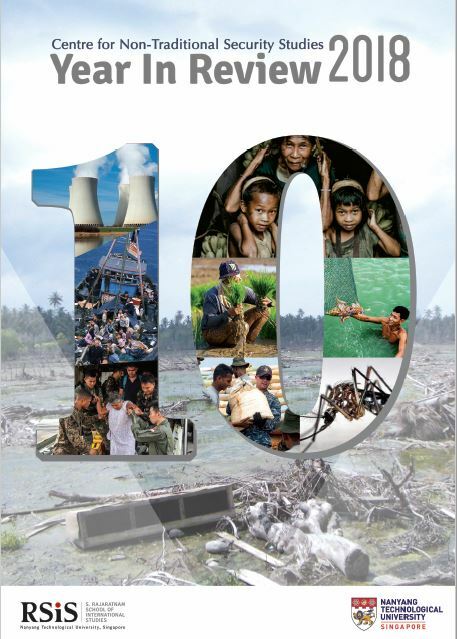 This annual publication is the centre’s reflections on the events of the past year and its staff’s contemplations on issues of non-traditional security in the region and beyond. The articles you will find within the pages of this publication resonate with the many research areas the centre focuses on but also extends beyond that. The articles examine the complexities and challenges of the many non-traditional security issues and highlight developments in this field of study. The NTS Centre Year In Review 2018 marks the centre’s tenth anniversary. This edition reflects on the study of non-traditional security studies and captures key events hosted by the centre over the past decade. The Year in Review 2018 considers the conclusion of global negotiations over people-on-the-move and its implications for the region. It also looks at the emergence of urban disasters in Asia as the next frontier in humanitarian action. We also highlight the development of Smart Cities and the implications for climate resilience. In addition, there are discussions on countering human trafficking with a data-driven approach, health challenges in ASEAN, strengthening marine environmental governance through the code of conduct in the South China Sea and the potential for floating nuclear power plants in ASEAN. Finally, as always, we showcase our centre’s activities for the year and the varied publications of our researchers in 2018.